Fathead pizza crust topped off with all of the goodness of a BLT. 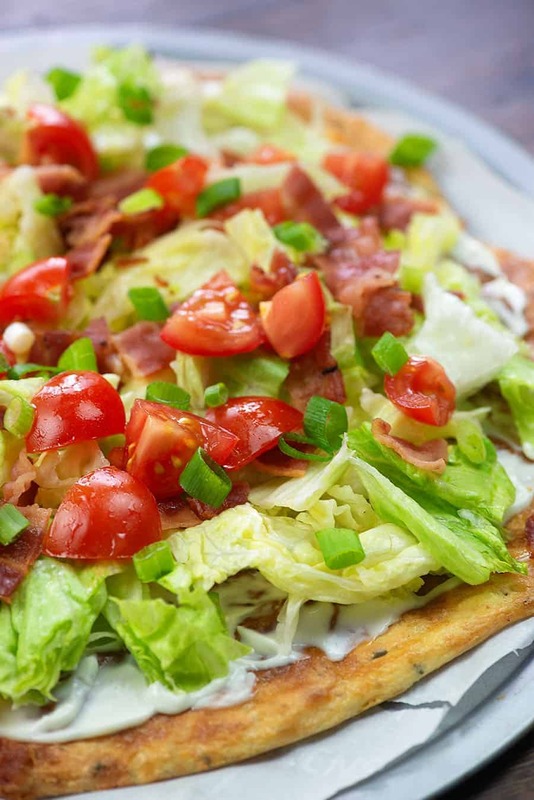 The crunchy lettuce, chewy bacon, and fresh tomatoes make this low carb pizza perfect for a summer dinner! 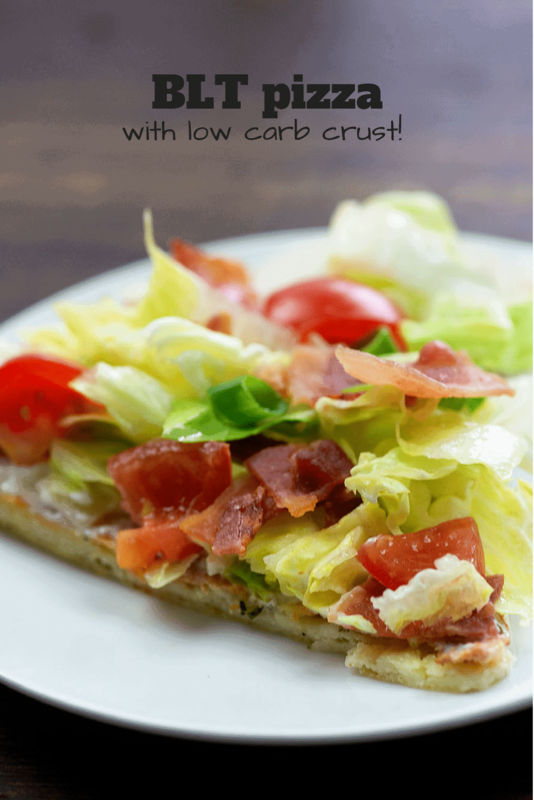 If you’re new to the low carb world, you maybe haven’t heard of fathead pizza. It is the BEST pizza crust that I’ve tried and I’ve done them all. The almond flour crusts. The cauliflower crusts. I’ve even done crustless pizza. This is THE ONE. My entire family prefers this crust over any regular pizza crust – yes, even the kind with actual wheat flour and yeast. I love the texture this low carb pizza crust provides. It’s a bit chewy, but also has some crunch. It holds up just like regular pizza dough – you won’t need a fork for this one. No one would ever guess it was low carb and gluten free! I have rolled the dough up to make wraps as well and it works fabulously. Just wait til you see how to make this fathead pizza dough. 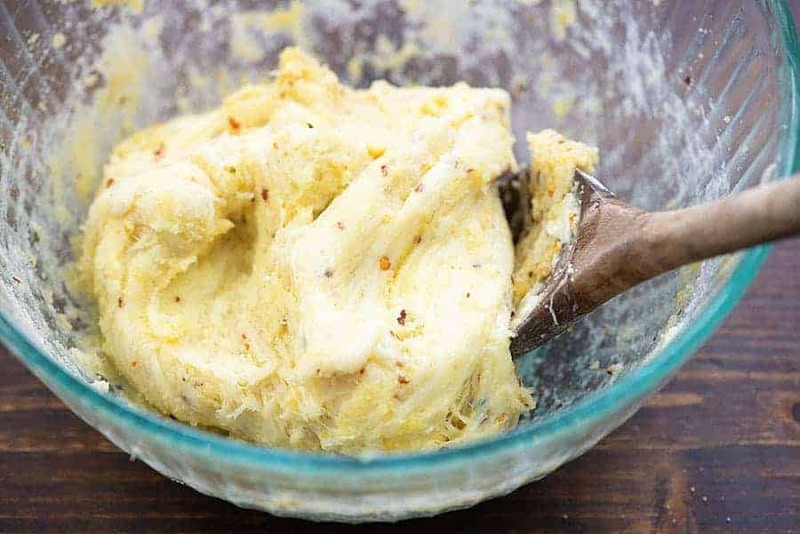 I also used this dough to make my spicy ranch crackers! The name and original recipe appears to come from a documentary about food and healthy eating. I’ve made a few changes here and there to suit my tastes and I’m reprinting it here for you to try! This low carb pizza crust starts off with cream cheese and grated mozzarella. You’ll pop those in a microwave safe bowl and heat until melted. Stir the cheese together and then crack in an egg and stir in some almond flour. I season my crust with a little Italian seasoning to give it more of a traditional crust vibe, but you can skip this if you’d like. This mixture will be a bit sticky, so pop it between two sheets of parchment paper and roll it out to form a pizza crust. Line your baking pan with parchment (do not skip this step!) and place your dough on top. This will bake in about 10 minutes. It’s summer time and I need a good BLT in my life. 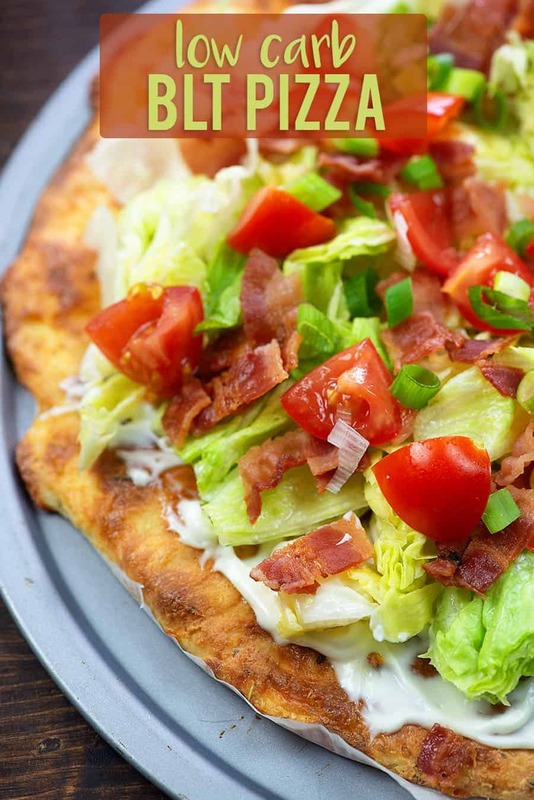 BLT pizza is the perfect answer to your summer time low carb dinners! You’re going to love this pizza as much as we do! 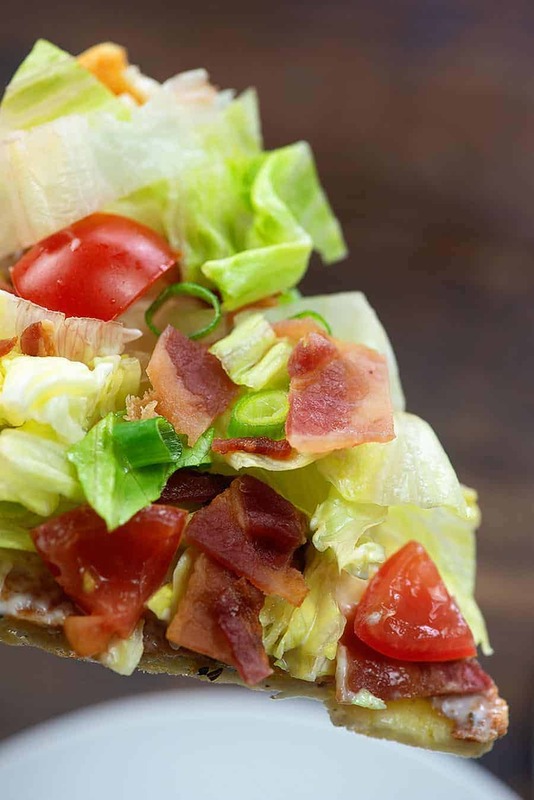 Next, top your crust with freshly chopped lettuce, crispy fried bacon, and chopped tomatoes. I throw in some green onions too, but these are totally optional. Slice your pizza into 6 pieces and dig in! I LOVE the way fathead dough tastes, but I also love how filling it is. Because it’s made with ingredients like cheese and almond flour, it really does fill you up and keep you full, unlike a traditional crust loaded with carbs. Give this fathead pizza crust a try and let me know what you think! Fathead pizza crust is a great low carb alternative to unhealthy pizzas! I topped this one off with lettuce, tomato, and bacon for a perfect summer dinner. Add the mozzarella and cream cheese to a microwave safe bowl and microwave for 1 minute. Stir to combine and return to microwave until cheese has melted, about 30 more seconds. Stir in the almond flour, egg, salt, and Italian seasoning to combine. 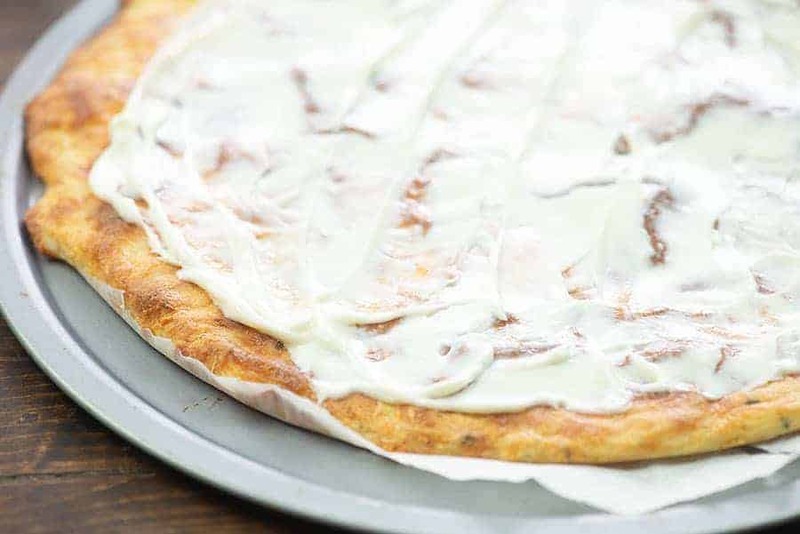 Place the dough on a large sheet of parchment paper. Top with a second sheet of parchment. Roll the dough out into a 12 inch diameter circle. Remove the top piece of parchment and transfer the bottom sheet with the dough on it to a pizza pan. Remove from the oven and spread with the mayonnaise. 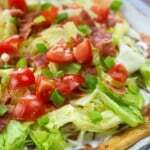 Sprinkle on the lettuce, tomatoes, bacon, and green onions. This crust requires parchment paper when baking. It will stick to your pan if you do not line it with parchment. Do you have any low carb desserts that you like? Do you think I would need the parchment paper if I use a pizza stone? Can this be made the day before and kept in the fridge? I don’t think the lettuce would hold up well at all. The crust would likely be fine, though. Can’t wait to try! So I can eat this whole pizza by myself and it will only be 3 net carb?! If making regular. Pizza with this crust would you double bake it or just everything on it then bake it all together? This is really good. My whole family loves it. I even use this crust to make regular pizza. My family thinks it’s great. I made this recipe just as you have placed it for all of us to enjoy. Yummy! Move over classic crust! Can you give me a suggestion to replace the almond flour as tasty as it is. My grandson is alerting to all nuts. I thank you for your suggestions. After agonizing moments choosing what to make tonight (so much to choose from, isn’t that great!) I picked your BLT pizza (it hit all the must haves tonight)! The whole family has only one regret… why didn’t I make two!?! Omg goodness!!! Plenty of bacon leftover for another one VERY soon. Thank you! Does this work if you don’t have a microwave? I have heated the cream cheese and mozzerella and then combined it with the dry ingredients. Worked somewhat well. I’ve only made it with a microwave, but it sounds like you made it work? I think sometimes I would be happy with the crust and some butter.